In introducing a burst of speed to the sedate world of ferry travel, the hydrofoil was for two decades at the forefront of fast ferry innovation, until the catamaran stole its thunder. Although long since resigned to playing a bit part in the ferry industry, the hydrofoil was once a major innovator. Its injection of high speed technology into the slow moving world of the passenger ferry helped to usher in the present era of the ‘fast ferry’. When the hydrofoil first appeared in British waters during the early 1960s it added a flash of aero-dynamism to the traditional ferry model, conceived as it was as a kind of cross between a boat and an aeroplane. From the outside the body looks much like a standard vessel but instead on resting on the water, its hull is mounted on stilts that are attached to wing-like foils. As the craft increases speed the foils, resting just beneath the surface of the water, generate enough lift to raise the entire vessel out of the water. The idea is not merely to thrill passengers with the novel sensation of flying above the surface of the water, but to significantly increase the vessel’s speed. With the hull out of the water, the resistance and drag is drastically reduced, and as such the hydrofoil is able to reach a much higher velocity. The first commercial passenger hydrofoil, PT10 ‘Freccia d’Oro’ (Golden Arrow) appeared in 1952 when it made its maiden voyage across Lake Maggiore, which is situated between Switzerland and Italy. This pioneer vessel, which was able to carry a maximum of thirty-two passengers at a speed of 35 knots, was the creation of Supramar, a Swiss-based company founded by Baron von Schertel. It was the first fruits of decades of hydrofoil research and development by the Baron. Following the success of the Freccia d’Oro, Supramar went on to design a series of hydrofoils over the following two decades, catering to forward-thinking ferry companies around the globe that saw the great potential of the sea-faring innovation. 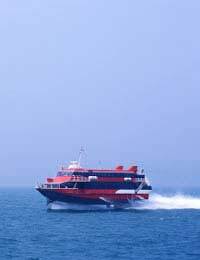 The hydrofoil made its first appearance in British waters when in 1964, new Jersey-based ferry operator Condor Ferries decided it would compete with the established Channel ferry companies by investing in this fast ferry technology. It proved a shrewd move, the Italian built PT50 named ‘Condor 1’ proved an immediate hit with passengers travelling between the Channel Islands of Jersey, Guernsey and Sark and the Brittany port of St Malo. Between its maiden year of 1964 and 1966, passenger numbers grew from 10,000 to over 60,000. The hydrofoil was never designed to succeed the traditional ferry but to complement it. With a foil structure only able to support the weight of a modest sized craft, its designers could never have harboured ambitions to one day create an all-conquering ocean faring hydrofoil able to carry cars, coaches and cargo. The hydrofoil was happy in offer foot passengers a fast service for short sea journeys. However, the hydrofoil’s niche role was not to last. The early 90s saw a new craft appear on the scene that combined its speed with generous capacity and passenger comforts. The catamaran was the new fast ferry on the block, and it made the hydrofoil look outdated very fast. Not surprisingly, the progressive ferry company Condor was quick to discard the old guard in favour the new wave piercing catamaran. The limitations of the hydrofoil were bound to seal its fate sooner or later. It may be quick but beyond that there wasn’t much for the ferry passenger to savour. There are few comforts on board, for instance. Most unappealingly it adopts one of the worst aspects of aeroplane design; consigning passengers to sit in close quarters in a confined cabin, when the freedom that most ferries offer the passenger is one of the highlights of sea travel. In addition to that it also wasn’t able to cope well in bad weather conditions, and services were often cancelled.